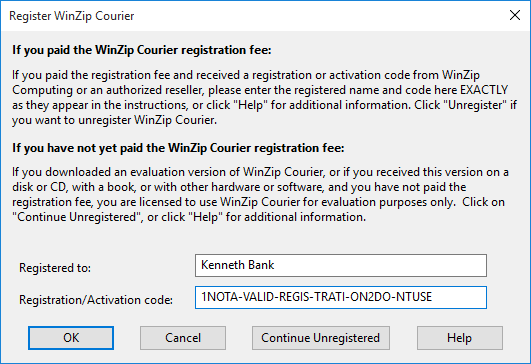 Note: If you do not have your registration information, please see WinZip - What is my registration code? 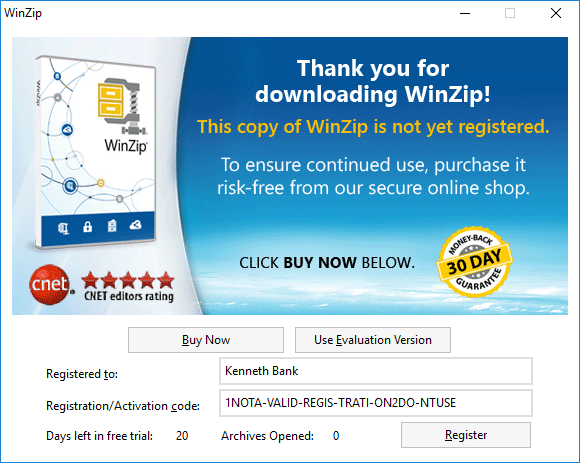 WinZip applications licensed to an individual (that is, a single-user license, not a multi-user license) have a registration code or they will obtain one by means of an activation code. Each set of instructions below assumes you have installed the correct major version of the appropriate application. The instructions are specific to the latest versions, but will be similar for earlier versions. Registration information for one major version will also register a minor upgrade (or vice versa), but it will not register another major version. For example, a registration code provided for WinZip 11.0 will also work with WinZip 11.1 and WinZip 11.2. However, a registration for WinZip 18 will NOT work with WinZip 19 or WinZip 17. When entering registration information, we recommend that you copy the code provided and paste it into the appropriate box. Specifically for WinZip, if you have entered your name and code correctly, but you see a message saying Incomplete or incorrect information, open the appropriate applet in the Control Panel for uninstalling programs and check to see which version of WinZip is installed. If you find a different major version is installed, download and install the correct WinZip version. Note: Starting with WinZip 21.5, when single-user registration information is entered, it will be transmitted to and checked by a server to insure it is valid. If the computer is not connected to the internet, you will see an error. Please contact WinZip Help for assistance if you are in this situation. If the dialog is for a different WinZip Courier version, download and install the correct version. 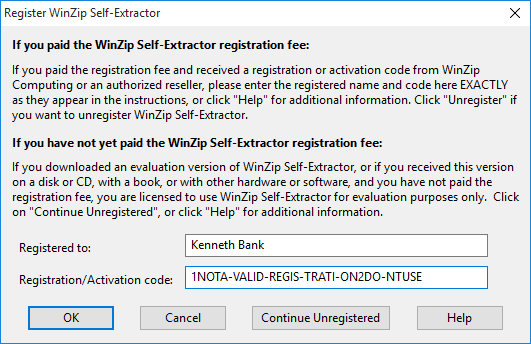 If the dialog is for a different WinZip Self-Extractor version, download and install the correct version. If you have difficulty with your registration or questions about this information, please email the Service Department.